It’s that time of year, when pundits, news outlets, and TV shows look back on the year in review, when Facebook and Twitter feeds are filled with best-of lists. So why not jump on the bandwagon? Here’s our look back at 2018 with our Top 18 preservation successes. 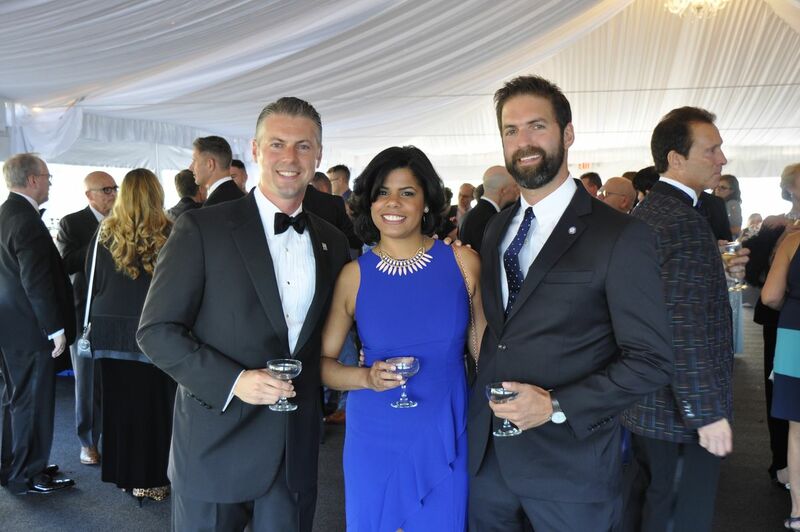 Thank you to everyone who supports our work; together we can make a difference in communities across WNY. You can continue to support successes in your community by donating to our 80th Anniversary Campaign. Here’s to many more successes in 2019! Parrott Hall in Geneva was named to our 2018 Five to Revive list in October but staff had been working on behalf of this building for nearly a year preceding the listing. 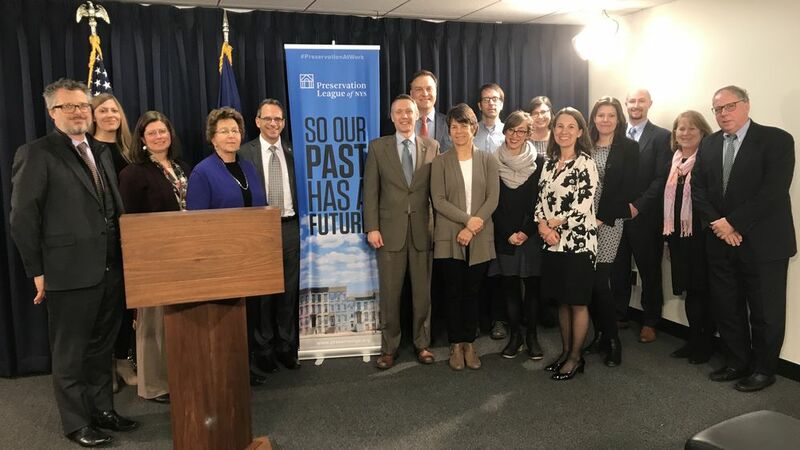 We formed a coalition along with the City of Geneva, the Friends of Parrott Hall, and the Preservation League of New York State to advocate for reuse. 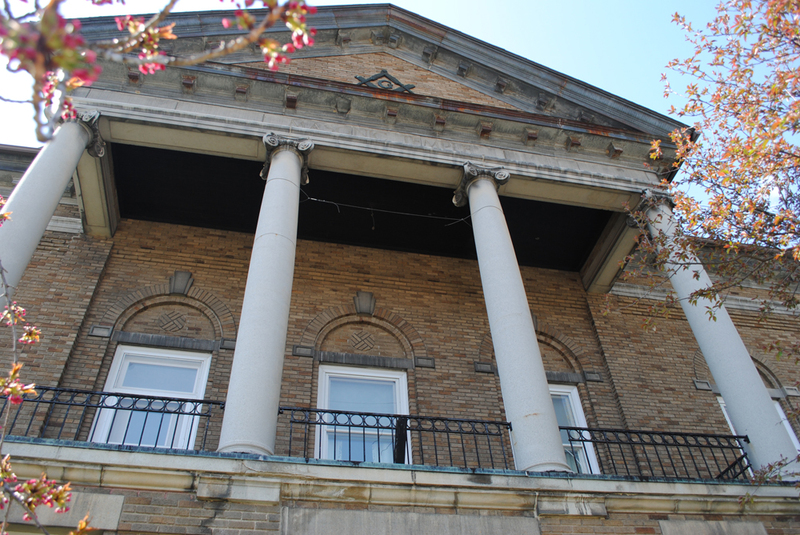 With a demolition contract set this past spring, the building was literally days away from demolition when its owner, the NYS Office of Parks, Recreation and Historic Preservation relented and agreed to work collaboratively with the Coalition. Since then, the Coalition has worked with NYS Parks to develop a plan for stabilization. 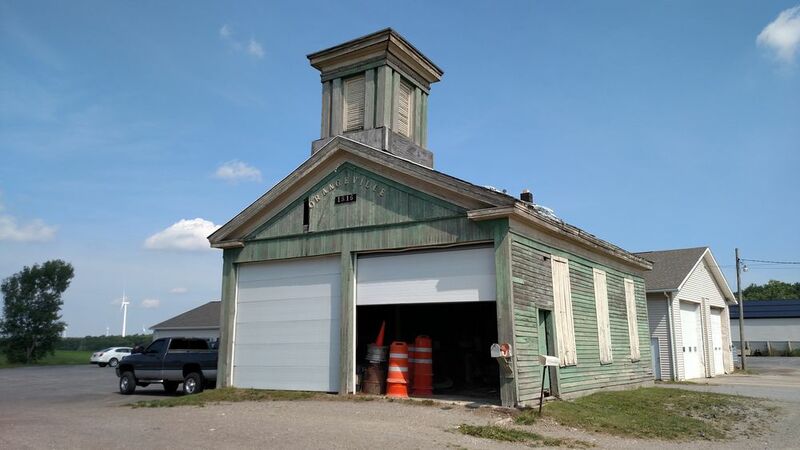 Just a few weeks ago, the City of Geneva received a $400,000 grant from NYS to help fund that stabilization, which will include remediation of hazardous materials and patching of the roof. We will continue to raise funds and develop plans for the complete rehabilitation of this important building. 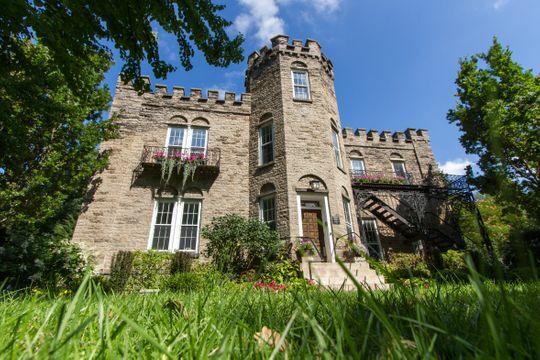 Along with our Five to Revive list, we made another important announcement in October–that we would be relocating our offices to Warner Castle in Highland Park. 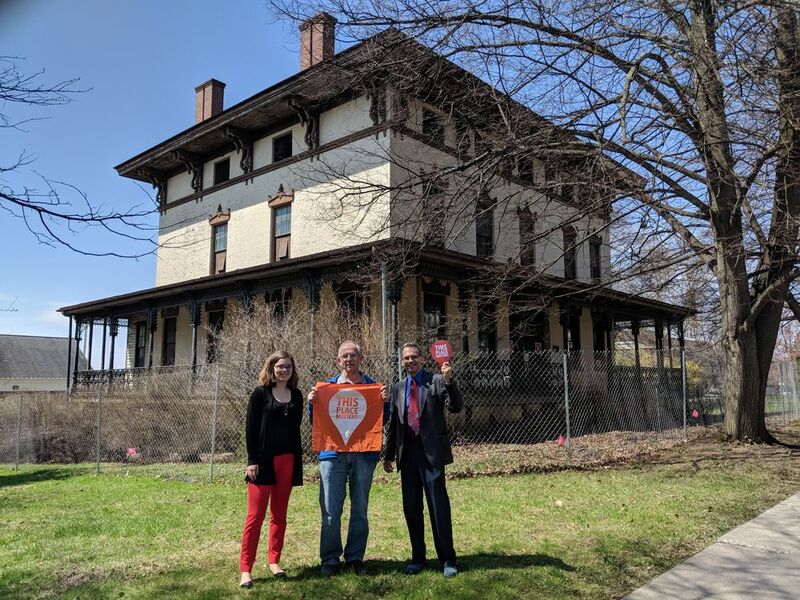 We are delighted to be working with Monroe County to spruce up this unique building and our staff can’t wait to work in a Frederick Law Olmsted-designed park. 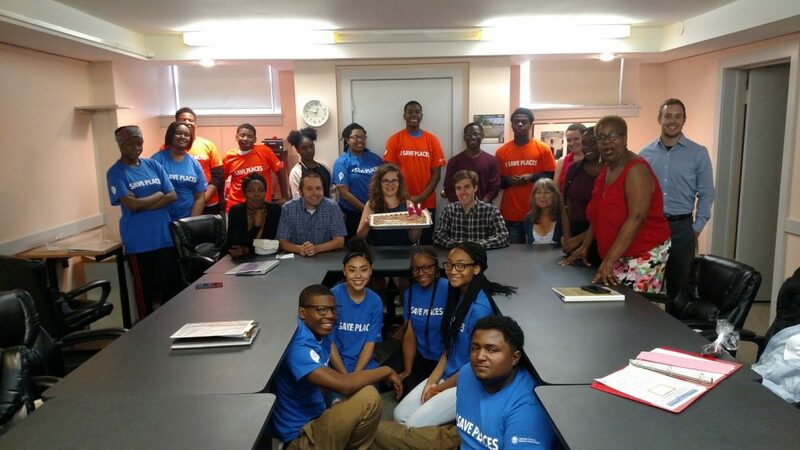 With the expert guidance of Dr. Suzanne Piotrowski of BadFish Consulting (along with the feedback of the community), the Young Urban Preservationists completed their first Strategic Plan. This plan will guide their work for the next three years. It also includes new mission and vision statements. If you’re roughly between the ages of 20 and 45 and want to learn more about the YUPs, attend their Open Meeting on January 10th where they’ll be presenting the results of the plan and where they’ll seek new members/volunteers. 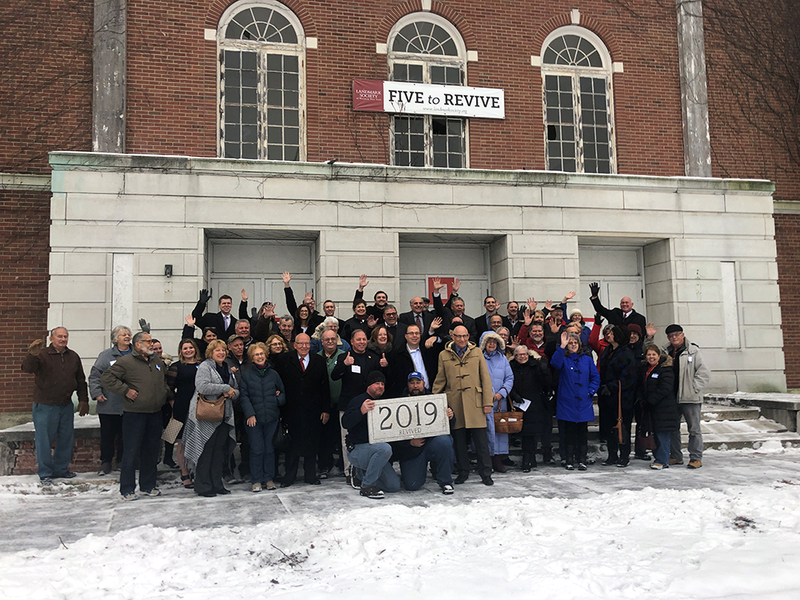 After a lot of determined work from Landmark Society staff and many neighborhood residents, the Park Avenue Historic District is closer to reality! Together, we have nearly reached our $55,000 fundraising goal! The consultant team has begun the extensive work that goes into a National Register nomination. 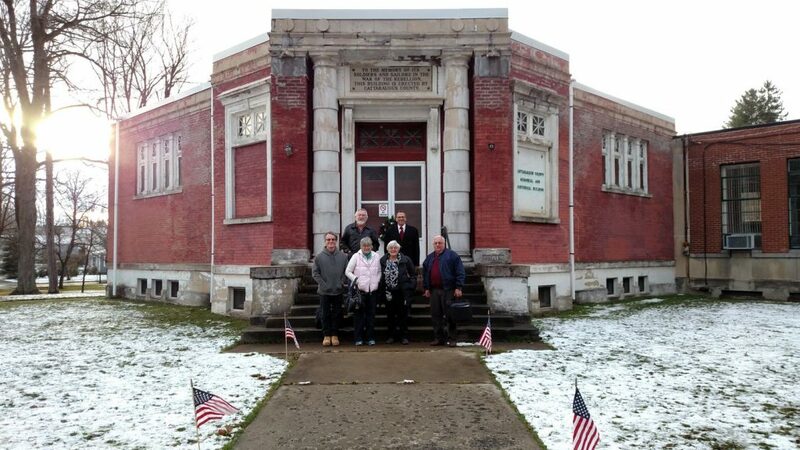 We were able to get this far with generous support from the Rochester Area Community Foundation and the Preservation League of New York State, as well as many neighbors, businesses, and neighborhood associations. Creative fundraising strategies were also essential. 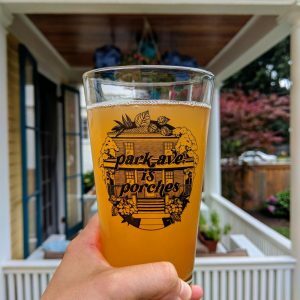 Working with local artist, Virginia McDonald, we developed “Park Ave is Porches” t-shirts, tote bags, and pint glasses. 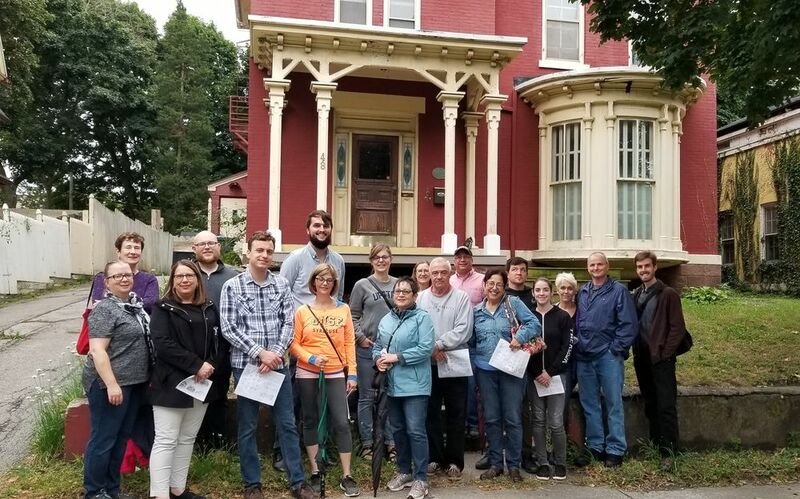 We also hosted two neighborhood walking tours, which included exclusive access to several historic homes in the neighborhood. First Ghost Walk cast, in 1994. The ghosts of Rochester’s past shared their gory and spooky tales for the 25th year, leading present-day Rochesterians down historic Arnold Park for a combination of history, architectural wonders, and a fun outdoor theater experience. 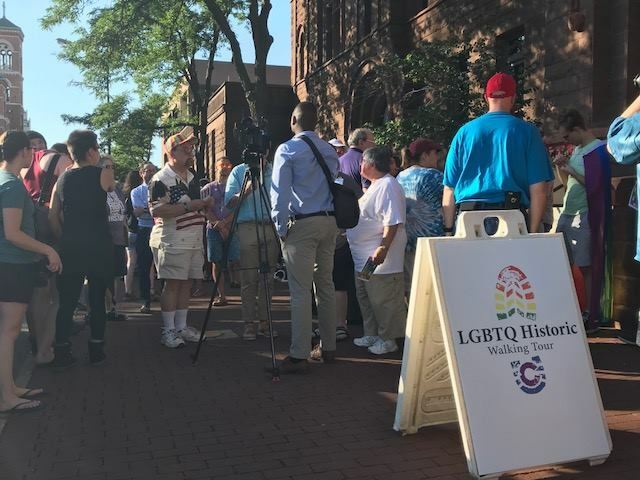 Our LGBTQ Landmarks initiative expanded in 2018 with several guided walking tours showcasing sites that were associated with the LGBTQ resistance movement. Our first tour had over 100 attendees! You can learn more about the initiative and contribute to our inventory of LGBTQ-affiliated sites here. Our St. Joseph’s Park in downtown Rochester continued to be a hit with a full booking of spring, summer, and fall weddings. 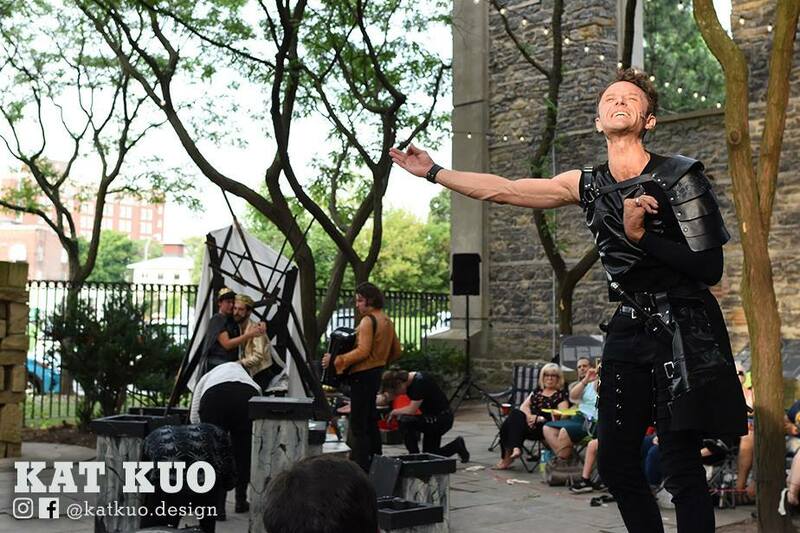 We hosted some new collaborative events, including Poetry and Pies with the Spirit Room and a performance of Richard III by Perry-based Shake on the Lake. We also started a new partnership with Downtown ROCs to help us open and close the gates each morning and evening during the summer. A thank you to all–including Bella Events–who continue to help make this special place a success! 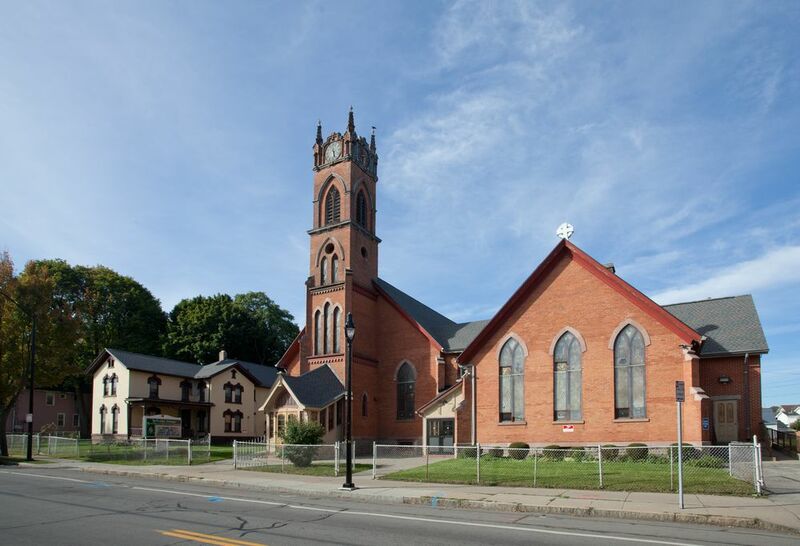 In April, the New Bethel CME Church at 270 Scio St. received official Landmark Designation from the City of Rochester. This designation protects the building for future generations should the congregation ever move. 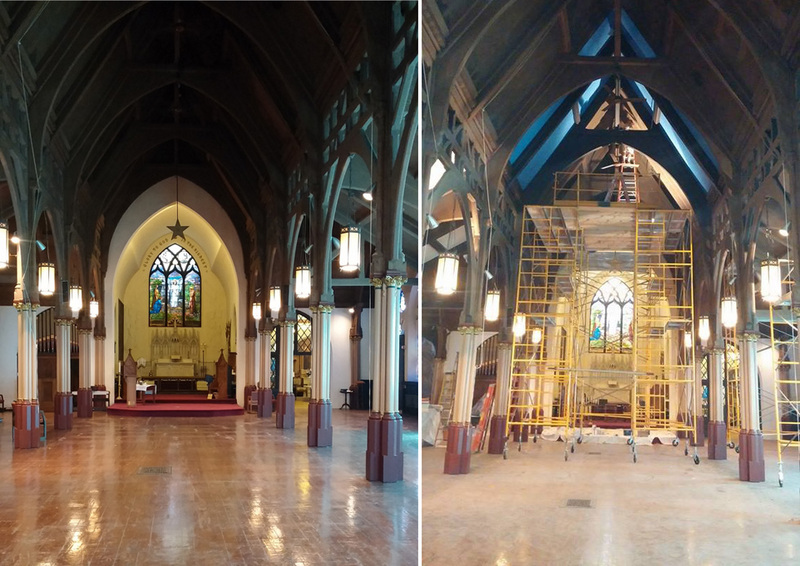 We are so proud of the dedicated staff and parishioners at New Bethel who, in addition to securing legal protection for their building, have worked diligently over the last few years to perform and plan for needed repairs to their historic building. In August, we provided a grant to help the congregation conduct a survey of the building’s exterior masonry and leaded glass windows. We know this building is in good hands! For the third year in a row, the Conference had sellout numbers, with over 360 in attendance in Albany last April. 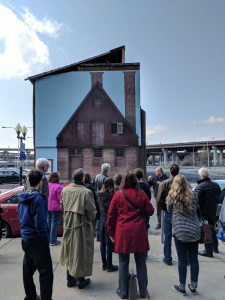 Highlights included a full day of training from the National Alliance of Preservation Commissions; a field session to Albany’s oldest building (dating to 1728! 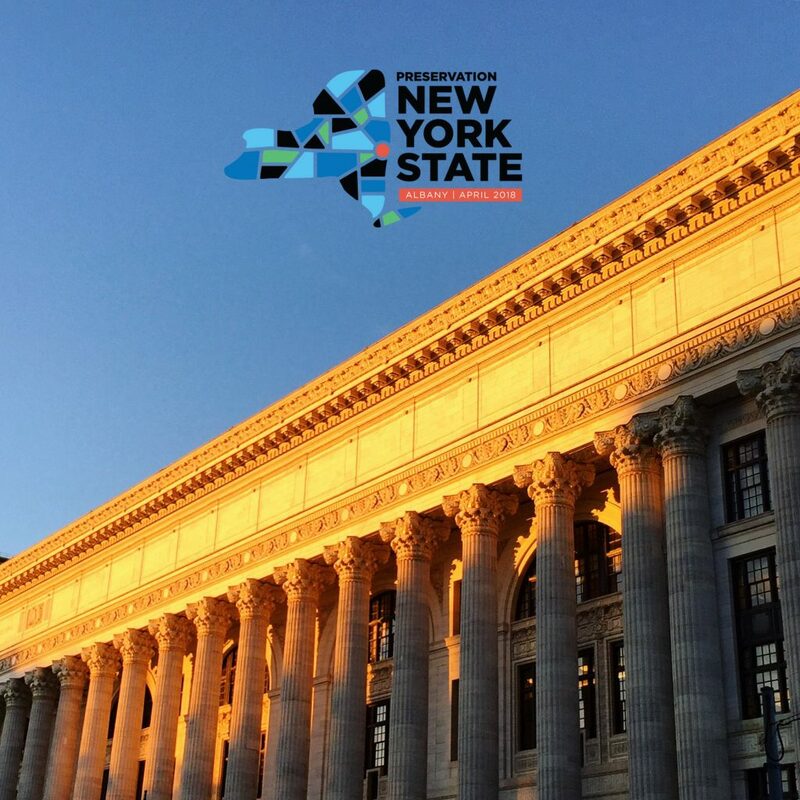 ); breakout sessions on homeowner tax credits, small-scale development, and land banks; and a Keynote and Party at one of Albany’s most fabulous hidden gems, the New York State Department of Education Building. In 2017, we celebrated saving the federal historic tax credits, which were in jeopardy as part of the federal tax reform bill. In early 2018, preservation advocates across NYS quickly rallied to advocate for the retention and enhancement of the NYS historic tax credits, which were initially left out of the Governor’s budget. 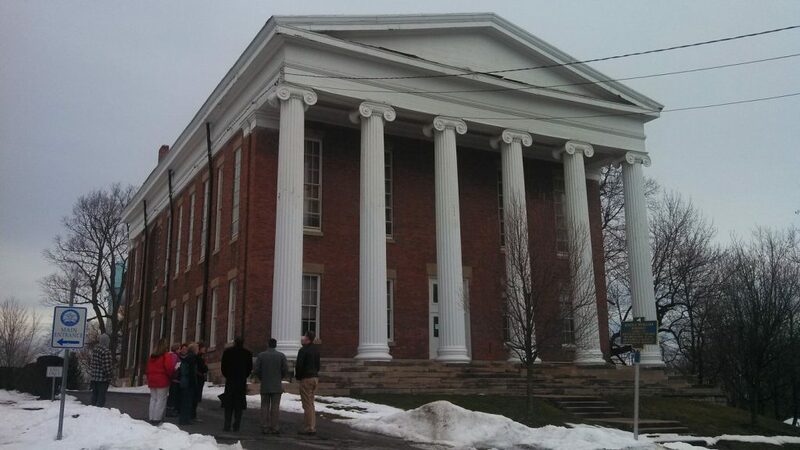 With the leadership of the Preservation League of NYS, Landmark staff met with our local elected officials and reached out to key stakeholders to advocate for the renewal of the program. 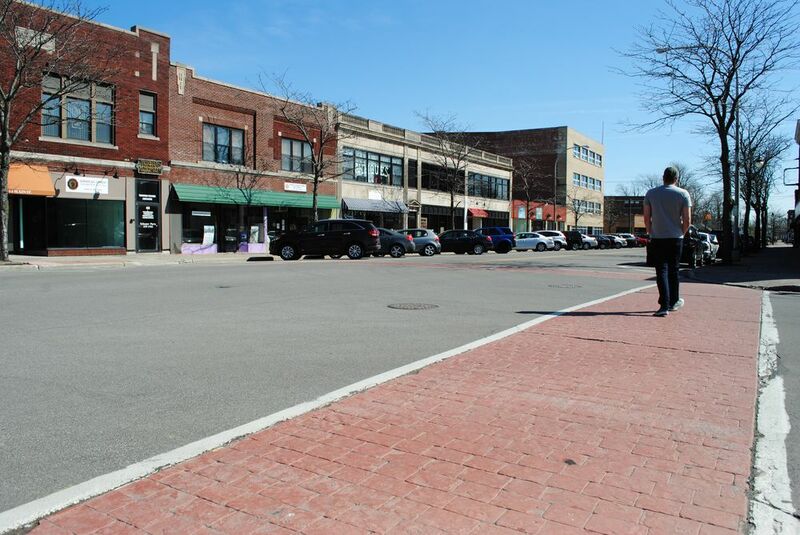 Both the federal and state tax credit programs make possible many of the historic redevelopment projects that we see around the city and the region. 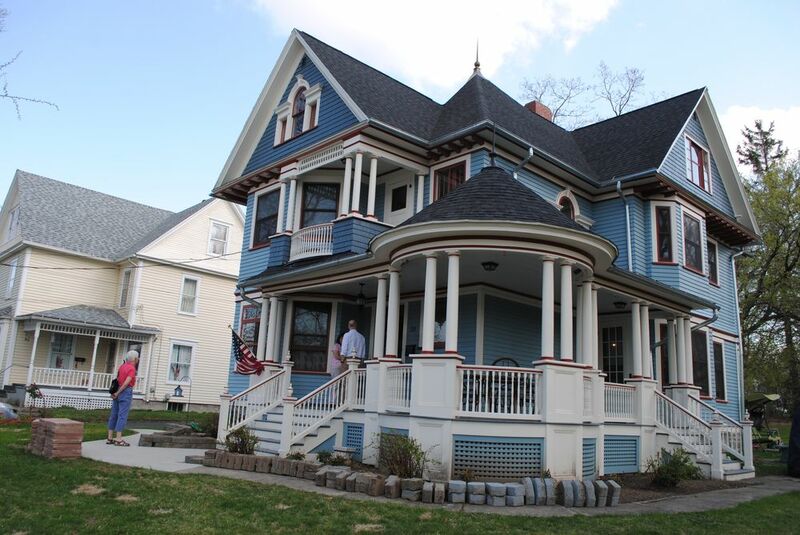 The NYS Historic Homeowners credit also helps homeowners maintain the character of their historic homes and neighborhoods. 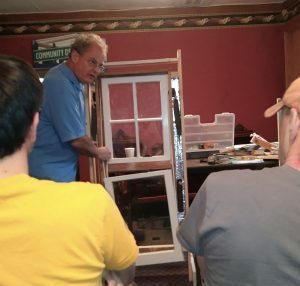 Partnering with the Cobblestone Museum outside of Albion, we hosted our first wood window repair workshop, led by our very own local expert, Steve Jordan. Participants not only learned the tricks of the trade, they also helped the Museum restore the historic wood windows in their c.1850 cobblestone schoolhouse. 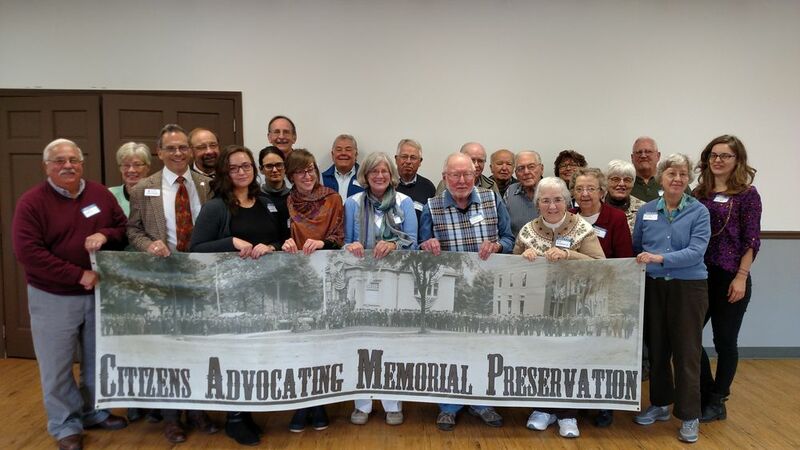 The workshop was supported by a grant from the Historic Preservation Education Foundation. Stay tuned in 2019 as we plan more training opportunities in the traditional trades. 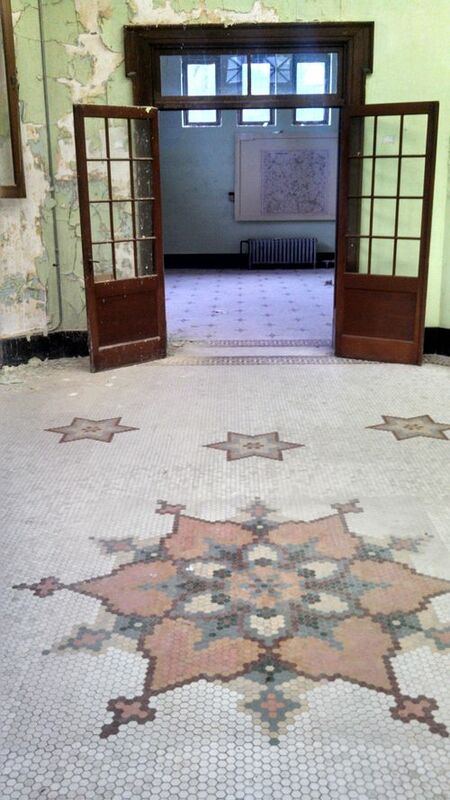 After decades of neglect and vacancy, the former Holley High School in the Village of Holley is finally on the road to rehab! Included in our inaugural Five to Revive list in 2013, the High School will be redeveloped by Home Leasing into a mixed use facility with senior housing and amenities, commercial and office space, and community space. Home Leasing officially broke ground on the project earlier this month and expects to complete the project by spring of 2020. 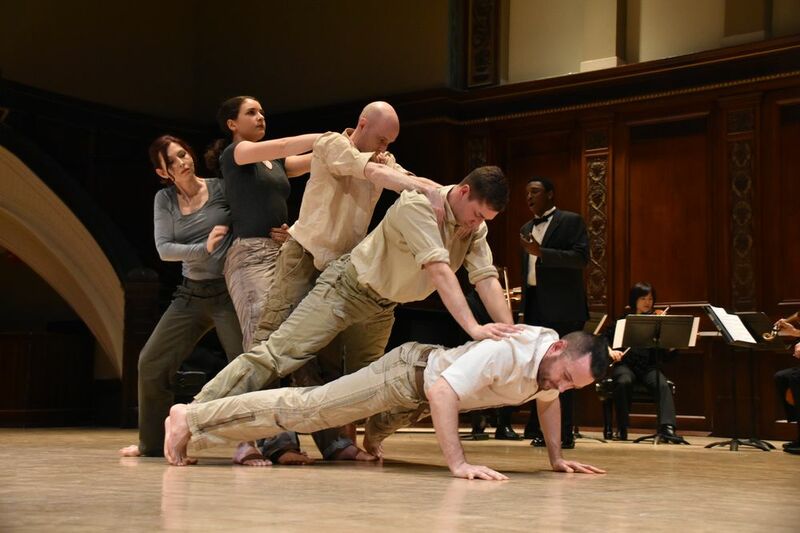 We wrapped up the celebration of our 80th anniversary with a few special events including a one-time collaborative performance at Hochstein Performance Hall with The Ying Quartet, PUSH Physical Theater, and this year’s William Warfield Scholarship Fund recipient, Jonathan Rhodes, vocal student at the Eastman School of Music. It was an evening to remember! In 2018, we expanded our fee-for-service work, offering consultant-based preservation services to non-profits and municipalities. We were honored to work with several communities throughout our region to help them complete historic resource surveys and nominations to the National Register of Historic Places. Historic resource surveys are important planning tools and can form the basis of future preservation planning activities, while National Register historic districts allow property owners to access state and federal historic tax credits. Our ongoing and completed 2018 projects include: City of Tonawanda, Village of Avon, hamlet of Port Gibson, the Village and Town of Naples, and the Corn Hill neighborhood in Rochester. We continued to work with the YUPs to return the Stone-Tolan Historic Site to its roots, hosting two Tavern Takeovers during the summer. This year, Silver Lake Brewing and Rohrbach served their local brews out of the early 19th century tavern. Even if you’ve been to Stone-Tolan before, this is a whole new way to experience the site, just like our forebears did! You get to wander through the house and the grounds at your leisure, ask questions of our docents, and take in the sunset with a cold local beer in-hand. We’ll be back at it again in 2019! Our travel tours continued to be a success with sellout trips to Niagara on the Lake, Montreal, and Savannah. 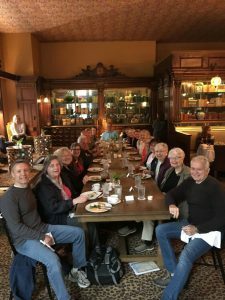 Traveling with us not only supports our mission-based work here at The Landmark Society, but it also gets you an insider’s look at the architectural marvels and historic communities where we travel. Our travel tourgoers also get to spend some quality time with Landmark staff–a nice bonus if we do say so ourselves. 2019 will take us to the Czech Republic, Cuba, and more! The YUPs continued to offer their always popular Crash Course in American Architectural History classes at the Rochester Brainery. 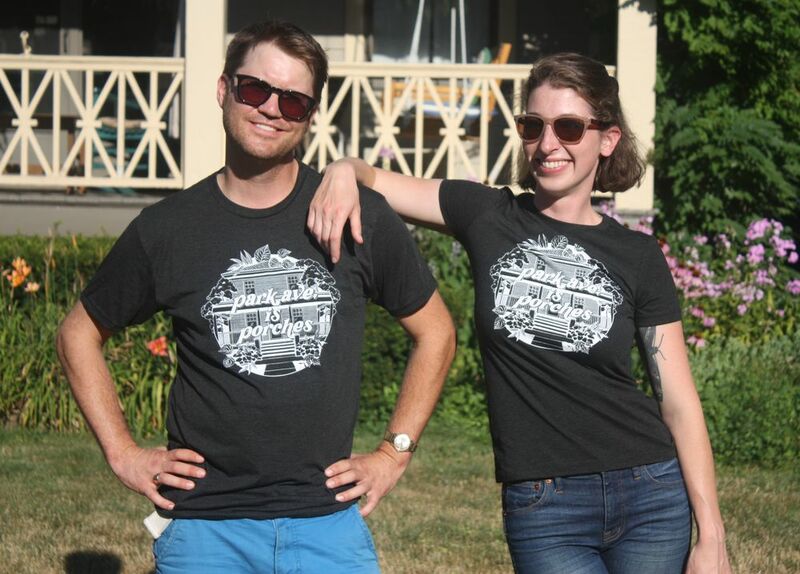 This summer they expanded their offerings to include several Architecture in the Wild courses, where participants learned about the architecture of the NOTA, East Ave., and South Wedge neighborhoods while walking through them. The YUPs will be repeating these classes again in 2019 and will also be offering some new subjects. Follow them on Instagram or Facebook to get the latest. 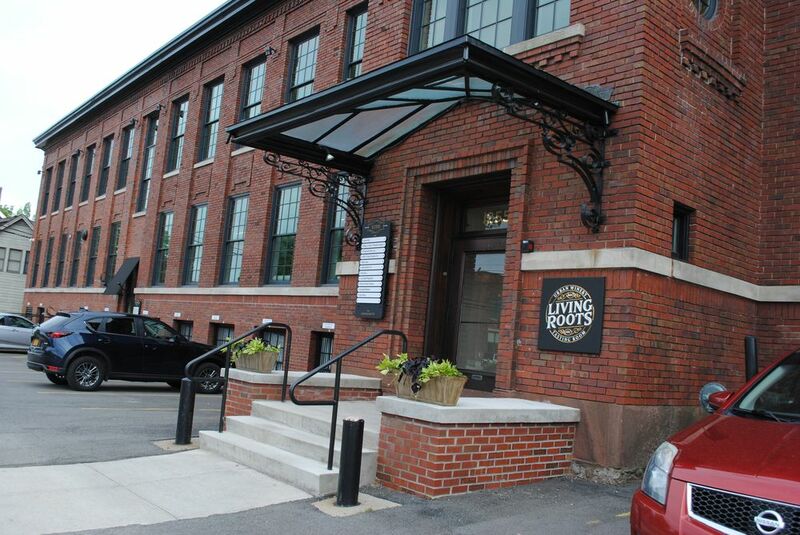 Another one of our Five to Revive listings experienced a successful turnaround in 2018—several of the buildings in an important downtown commercial block on Main St. in Perry were rehabilitated by developer Greg O’Connell, who previously made a name for himself in western New York rehabbing downtown buildings in Mt. Morris. 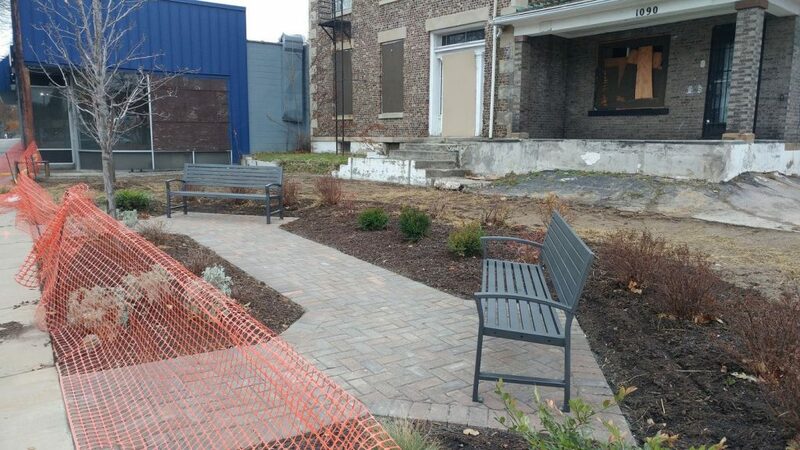 This transformation was made possible by years of hard work on the part of the Perry Main St. Association and the Village of Perry, as well as a Restore NY grant. Of course, none of these successes would be possible without the support of our members, donors, sponsors, tour-goers, and the community at large. So THANK YOU for supporting our work to protect irreplaceable historic places and revitalize communities. 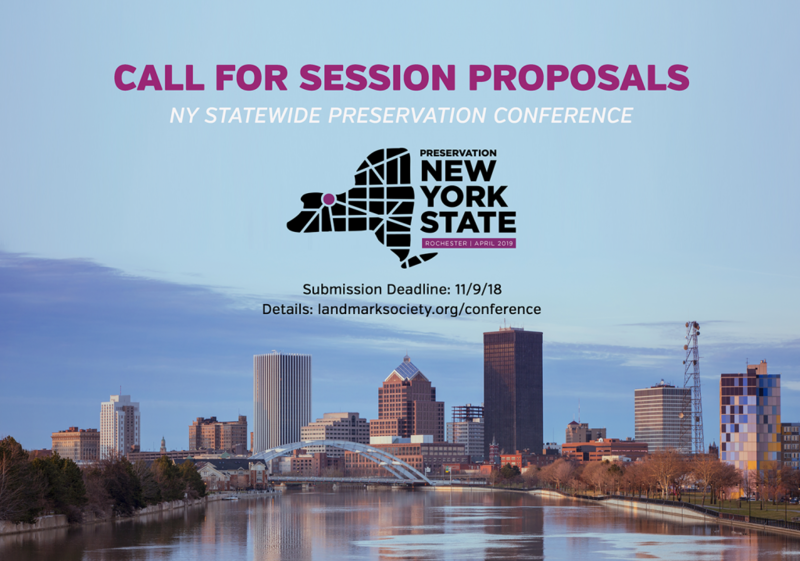 We are now accepting proposals for educational sessions at the NY Statewide Preservation Conference! The Conference returns to Rochester, NY April 25-27, 2019. Sessions that include diverse panelists/speakers, including people of color, women, LGBTQ, and youth. All panels should strive to be inclusive and represent diverse perspectives. Topics that explicitly address ways in which preservation as a movement and a professional field can become more inclusive and representative. 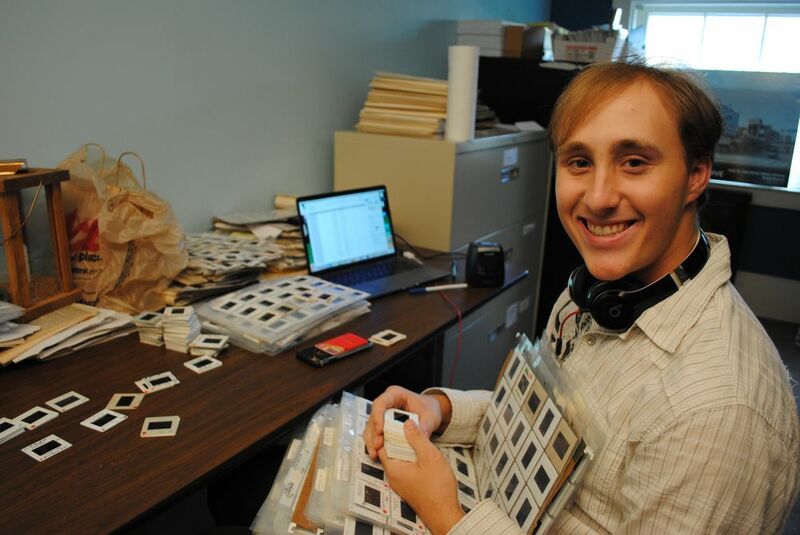 You do not need to be a preservation professional to share your story. Whether you are a grassroots community activist, an urban planner, a non-profit organization, an architect, a neighborhood group, a developer, property owner, or a municipality, we want to hear from you! We are looking for a diverse range of topics that include everything from neighborhood advocacy and small town revitalization to complex tax credit rehab projects and place-based event planning. Proposals are due by Friday, November 9th at midnight. >>Click here for complete details and to submit your proposal. ADVOCACY ALERT – We need your help! 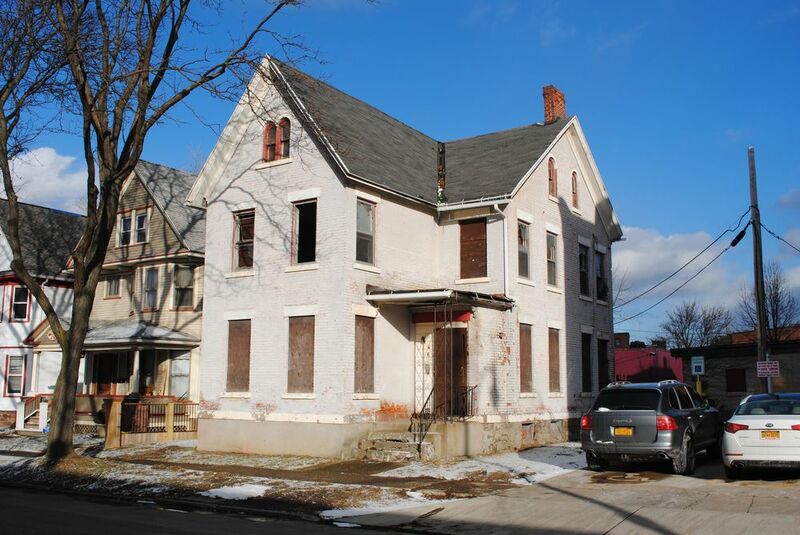 As many of our members and followers may know, New York State is lucky enough to have two excellent state historic tax credit programs: the NYS Historic Tax Credit Program for Income Producing Properties (or the NYS Commercial Tax Credit), and the NYS Historic Homeownership Rehabilitation Tax Credit. 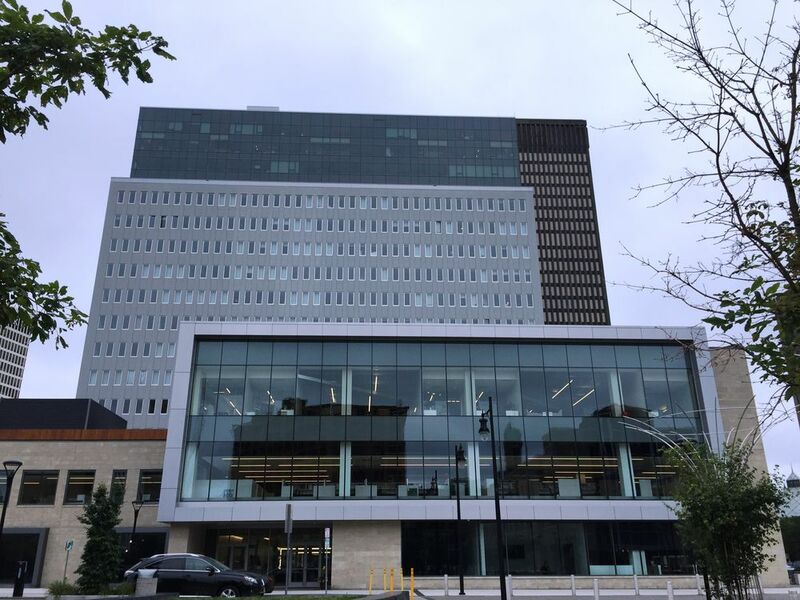 The NYS commercial program works alongside the Federal Historic Tax Credit program and has been a critical element in the ongoing revitalization and economic development in downtown Rochester, city neighborhoods, and other smaller communities throughout our region. 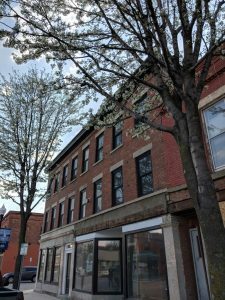 Many of the adaptive reuse projects we’ve seen across our region simply would not have been possibly without these programs – projects like Sibley Square, Eastman Dental Dispensary, Hilton Garden Inn, Carriage Factory Apartments, and many more. 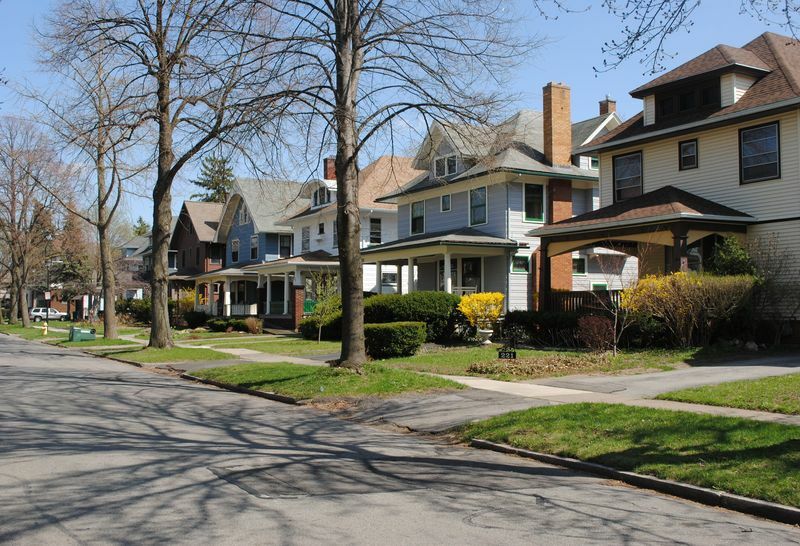 The NYS Homeowner program provides tax credits to owner-occupied homes in historic districts and individually listed National Register properties. This program has helped homeowners in neighborhoods like Maplewood, the 19th Ward, Browncroft, the South Wedge, and more make improvements and repairs to their homes. (Visit the State Historic Preservation Office’s website to learn more about these programs). Unfortunately, the NYS tax credit programs were not included in the Governor’s Executive Budget released on January 16th. This means the existence of these programs is at risk. But it’s not too late for your voice to make a difference. We need your help to communicate the economic value of the historic tax credit programs to NYS elected officials NOW. Please contact your State representatives in the NYS Assembly and Senate as soon as possible to let them know that the State Historic Commercial and Homeowners Tax Credit programs are important to you. Ask them to advocate for them in the budget process. 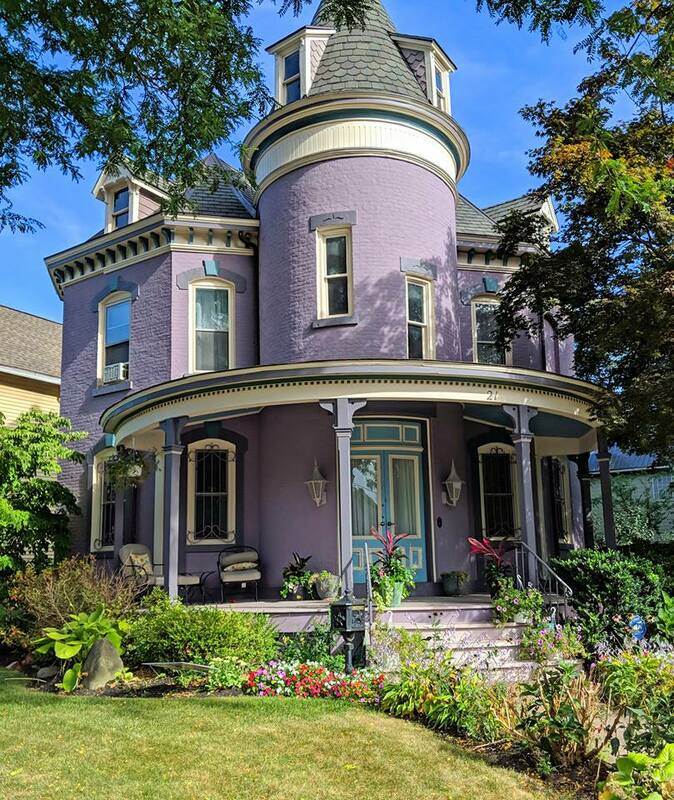 The Landmark Society (and our statewide partners at the Preservation League of NYS) are focusing on two major requests: (1) extending the credits through 2024 and (2) de-coupling the state commercial credit from the federal historic tax credit. Assemblymember Carrie Woerner and Senator David J. Valesky have introduced legislation to accomplish these goals (A.9882 / S.7648). Please write or call your NYS Assemblymember and Senator right away to ask them to include this legislation in ongoing budget negotiations. Not sure who your NYS Senator is? Click here. Not sure who your NYS Assembly representative is? Click here. I write to you to ask for your support of the NYS Historic Commercial and Historic Homeowners Tax Credit programs. As you may know, neither program was included in Governor Cuomo’s budget. As a citizen who lives in a community that has benefited greatly from these programs and stands to be harmed by their loss, I urge you to advocate for their inclusion in the 2018 budget. The state and federal historic tax credit programs have been essential tools in economic development efforts throughout western New York. 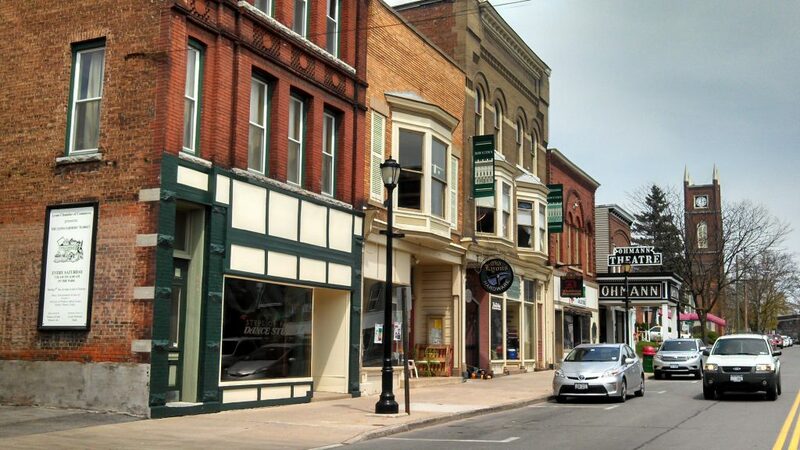 Without these programs, the ongoing revitalization of downtown Rochester and smaller rural communities in our region would be weakened and many more historic buildings would sit vacant, not contributing to local tax rolls. The passage of the Federal Tax Cuts and Jobs Act of 2017, which requires that the credit be spread over 5 years, has negatively impacted the market for historic tax credits and has jeopardized investor confidence in tax credit projects. Because the NYS Historic Commercial Tax Credit is linked to the federal, the changes in the federal program have also weakened the value of the state program. (1) Extend Historic Tax Credits through December 31, 2024. 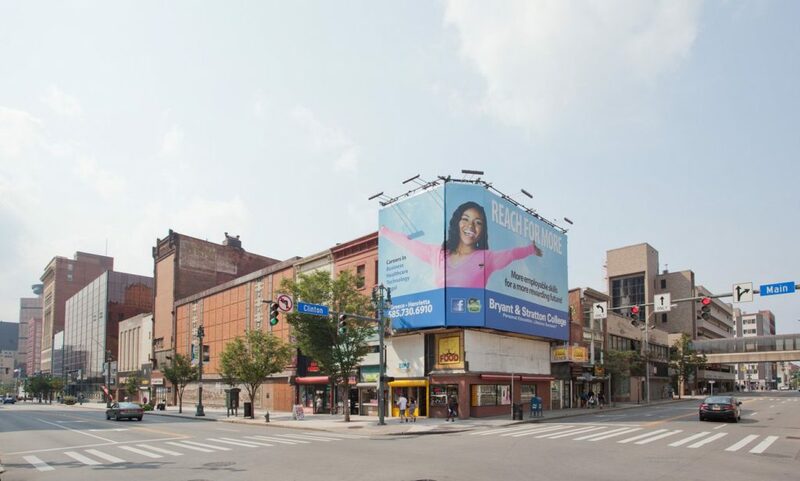 The extension of the NYS Historic Commercial Properties Tax Credit and NYS Historic Homeownership Rehabilitation Tax Credit will ensure that projects currently in the pipeline for investment and rehabilitation continue to move forward, with investor and developer confidence that the program will remain in place. 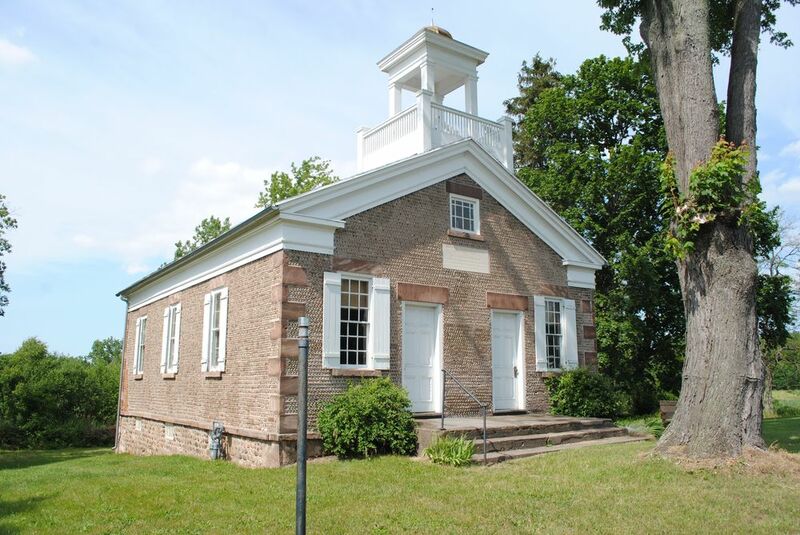 (2) Decouple the NYS Historic Tax Credit from the Federal Historic Tax Credit. Decoupling will ensure that the NYS credits may be taken all at once rather than over 5 years as the Federal Tax Cuts and Jobs Act of 2017 requires. Current estimates place the impact of this change at a 15% credit value reduction. If the credits are not decoupled, then the NYS Historic Tax Credit would likely see a similar reduction in value. Assemblymember Carrie Woerner and Senator David J. Valesky have introduced legislation to accomplish these goals (A.9882 / S.7648). I’m asking you to support and include the language from these measures in Joint Legislative Budget Bills which will be drafted in March. It’s that time of year, when pundits, news outlets, and TV shows look back on the year in review, when Facebook and Twitter feeds are filled with best-of lists. So why not jump on the bandwagon? Here’s our look back at 2017 with our Top 13 (we couldn’t limit ourselves to just 10!) preservation successes. Here’s to many more successes in 2018! Founded July 1937, The Landmark Society has been celebrating its 80th Anniversary year with a number of special events, beginning with our first-ever Gala attended by over two hundred in September, and continuing through the coming year with a night of performing arts in February, an al fresco dinner at our downtown St. Joseph’s Park in July, an art exhibition in September, and travel tours to Savannah, Georgia and Niagara-on-the-Lake, Ontario – watch for more updates. We also launched our 80th Anniversary Capital Campaign to provide the grounding for our continued work on behalf of preservation across our region in the many years we have ahead; please consider joining us in in this work with a gift to the campaign. Vacant for over a decade and listed on our 2015 Five to Revive list, the c. 1835 Lockwood-Alhart House on Culver Rd. – the city of Rochester’s only surviving cobblestone – is finally seeing new life: ground was broken for a micro-park on the property in August with funding from NeighborWorks Rochester, and the Triangle Neighborhood held a “Cobbleween” event for neighborhood families on the premises on Halloween night. Moreover, developer interest in the structure, and our funding of studies for the property through our Preservation Grant Fund, means there might be more good news on this unique community resource soon! 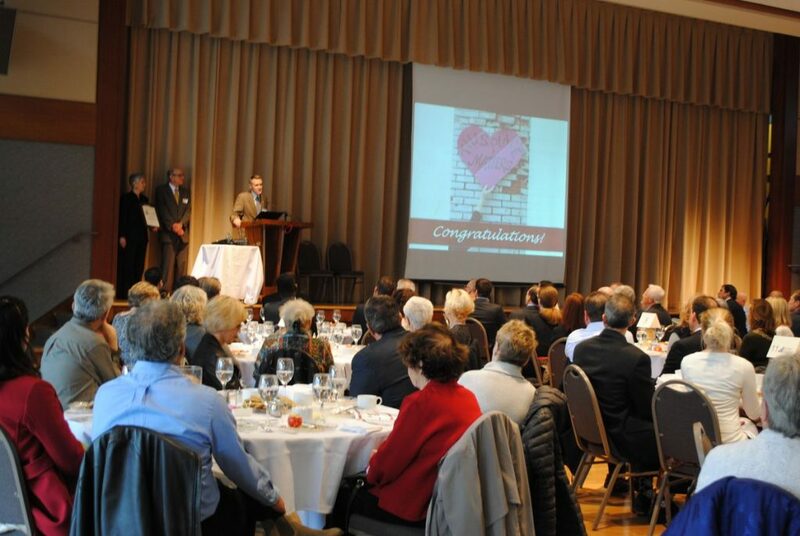 The Landmark Society was honored to receive honorable mention for the Joni Monroe Award at the Rochester Community Design Center’s 2017 Reshaping Rochester Awards ceremony in November “for its longstanding commitment to preservation in the community”. We admire the tireless work RCDC and its founding Executive Director Joni Monroe have done to ensure that the Greater Rochester region’s people and communities have a built environment befitting their potential and aspirations, so it is humbling to receive this recognition. When the Calvary – St. Andrews congregation dissolved earlier this year, the future of the unique late 19th-century church building they left behind, and the vitality of the surrounding residential South Wedge neighborhood, was in question, but thanks to the enterprising work of the Friends of Calvary – St. Andrews organization, the sublime property was protected as a City Landmark by the Rochester Preservation Board in the fall, and will continue to be enjoyed by the community as it is repurposed as an event and performing arts space. 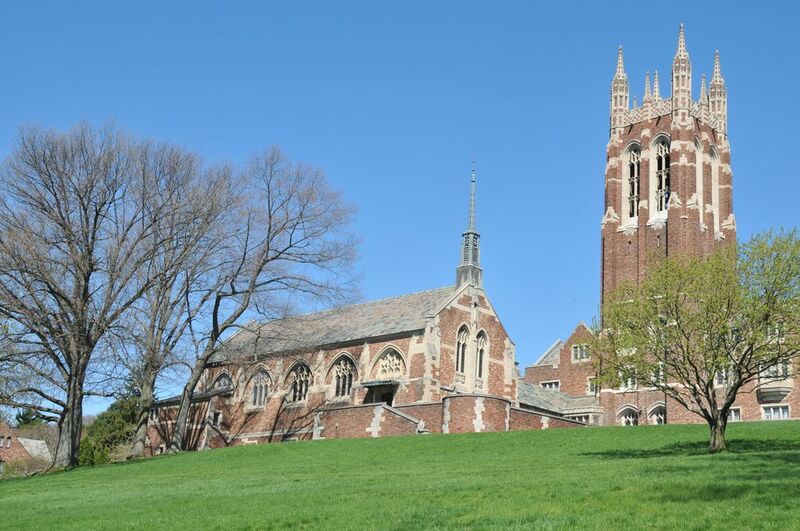 The Colgate Rochester Crozer Divinity School campus (including its historic buildings and designed landscape) became an official designated City of Rochester Landmark in September. This means that as the property transitions to new owners, neighbors and the larger Rochester community can be assured that any new development will be sensitively incorporated into the historic campus, with review by the City’s Preservation Board. 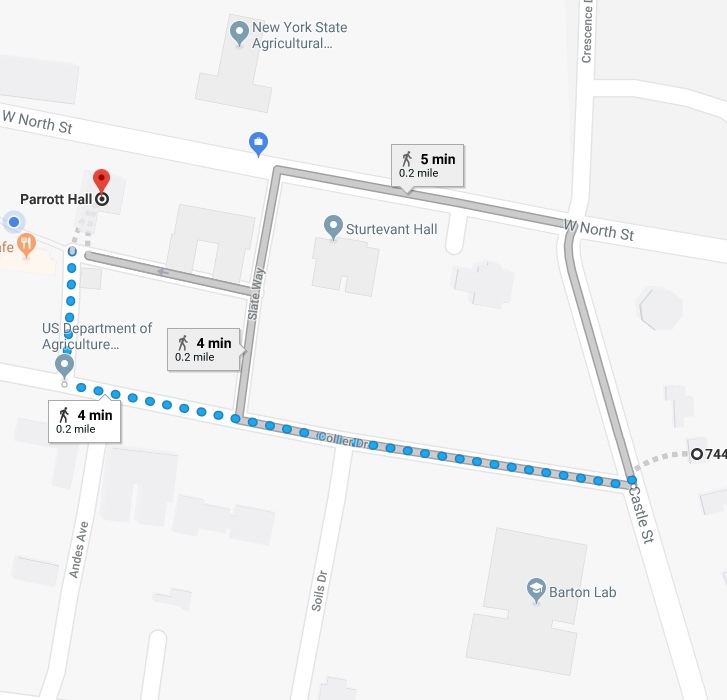 The features that give the campus its economic value will be preserved so that it can continue to be a part of the community long into the future. 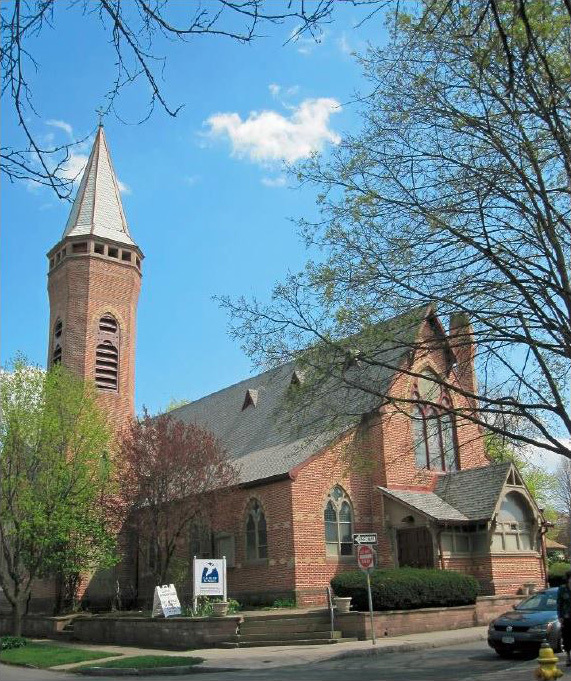 The Landmark Society, along with a coalition of organizations that included Highland Park Neighborhood Association and NBN6, worked with the owners at Colgate Rochester Crozer Divinity School, to amend the landmark application and determine appropriate boundaries. 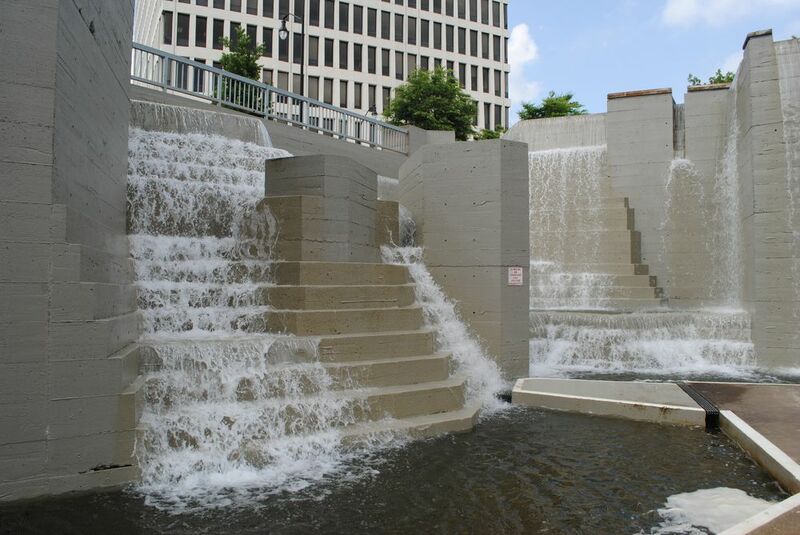 Flowing water is a recurring theme and major attraction in prominent landscape architect Laurence Halprin’s work – including in his FDR Memorial in Washington and his Freeway Park in Seattle – but the fountain he designed for Rochester’s Manhattan Square (now renamed Martin Luther King Jr. Park) was dry for several decades…until the City of Rochester turned the water back on this summer after significant renovations! 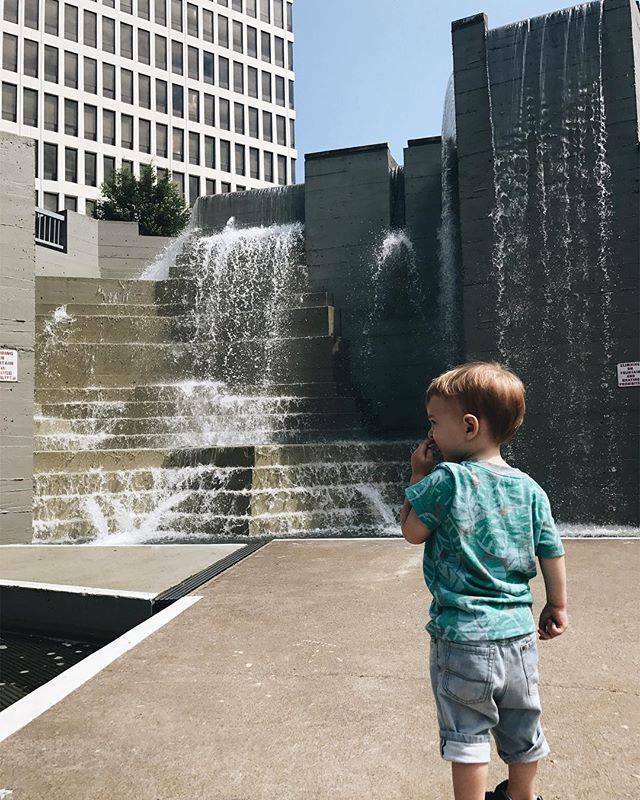 Cascading water has brought life and attracted people back to what had been a little-used and oft-maligned corner of the downtown landscape, pushing it closer to being the community focal point Halprin had hoped and intended it to be. Click here to read more. 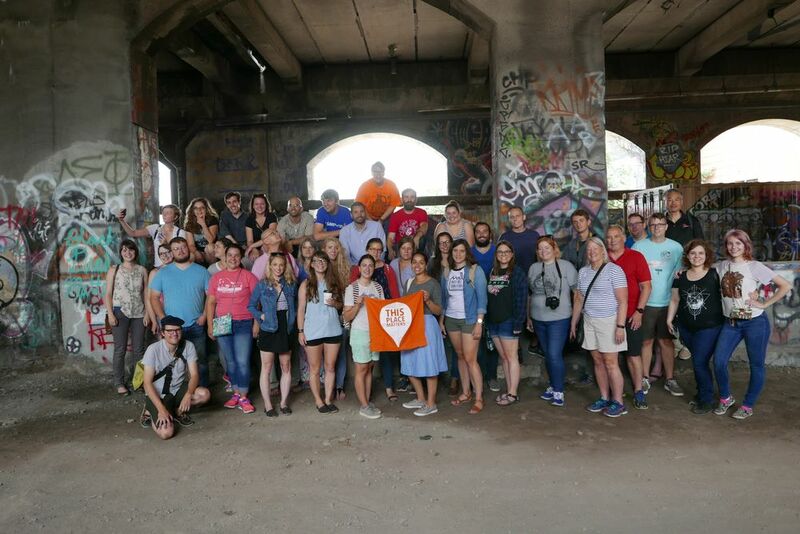 In July, The Landmark Society’s Young Urban Preservationists hosted a Rochester meetup of the Rust Belt Coalition of Young Preservationists. 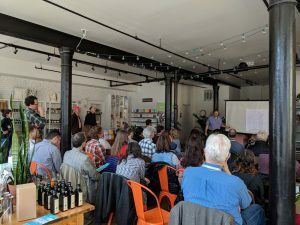 Nearly 70 preservationists came from Rust Belt cities (and beyond) to explore the Flower City’s history, preservation successes, and challenges. Visitors toured Mt. 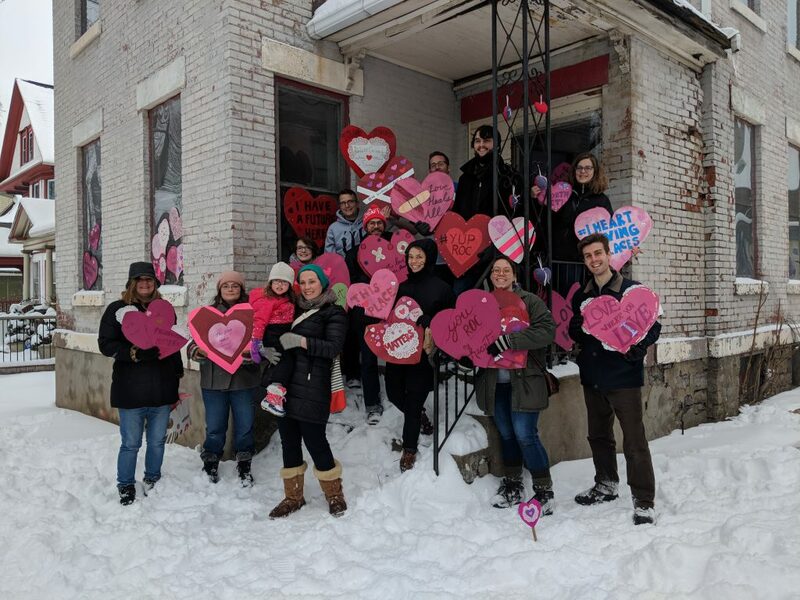 Hope Cemetery, High Falls, Wall\Therapy murals, the Public Market, and sampled local fare from adaptive reuse projects like Radio Social, the Swillburger/Playhouse, and of course, Nick Tahou’s. 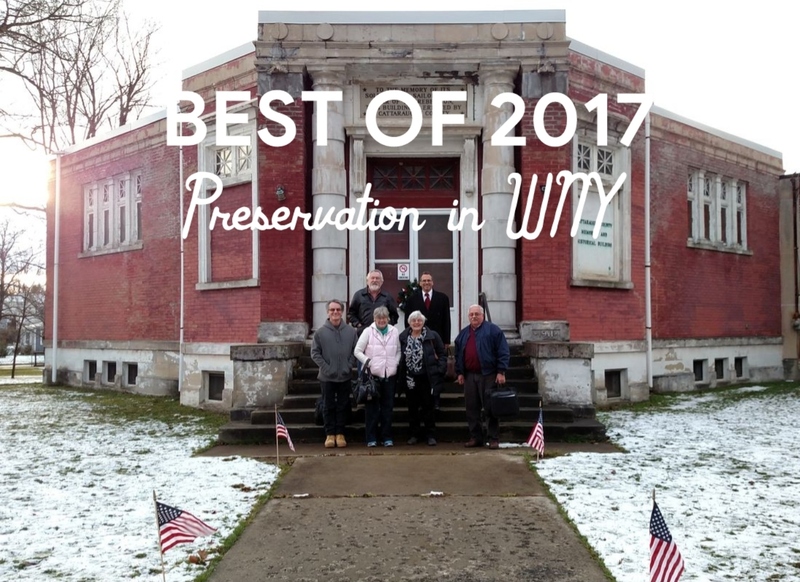 The preservation and reuse of the Cattaraugus County Memorial & Historical Building, one of our 2015 Five to Revive, took a big leap forward this month when local preservation advocates from Citizens Advocating Memorial Preservation (CAMP) took ownership of the building from the County. For the past three years, the County had had plans to demolish the building. CAMPers still have a long way to go to develop plans and raise funds to rehab the building but we’re incredibly proud of their efforts so far and we’ll be working with them to secure this important building’s future. The Landmark Society was the home for a youth employment program this past summer. Put a Face to the Place: Afro Rochester was a research based project to study local history through the lens of the built environment and biography, and produce a video documentary. It was funded by the Summer Youth Employment Program at RochesterWorks, Inc who partnered with Landmark Society and Kuumba Consultants. The program offers youth a summer job, but also provides training in employment and life skills, to further their future success. The final project was a video documentary of faces and places chosen reflecting local Afro Rochester: Put a Face to the Place: Afro Rochester a video to teach about the remarkable people and place of our city. Click here to see the video and meet the youth. 2017 saw yet another year of record-breaking attendance at the NY Statewide Preservation Conference with nearly 370 attendees from around the state. The Conference took place on E Main St. in downtown Rochester, showcasing the ongoing successes in the heart of downtown. We were honored to welcome Amy Nicole Swift, principal and owner of Building Hugger in Detroit, to Rochester as our Keynote Speaker. Amy spoke about the importance of expanding training and employment opportunities for women and young people in the traditional trades. After a full day of conversation and learning at a wide range of breakout sessions and networking with fellow colleagues and community advocates, attendees were able to wind down at a special Preservation Partners Party at the Genesee Country Village and Museum. After decades of being covered up by a two-story billboard, the historic facade of the building at the corner of Main and Clinton Streets in downtown Rochester was finally unveiled this fall! 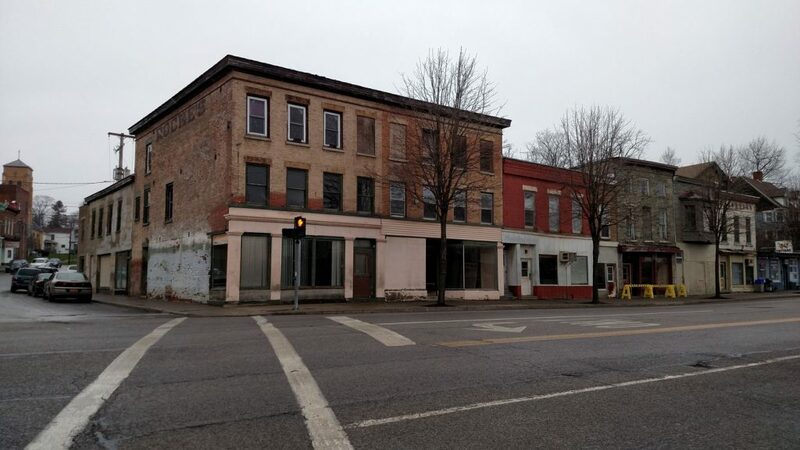 Property owners are in the process of planning a major rehab for this building–just one more step forward in the revitalization of this 2015 block of Five to Revive buildings! 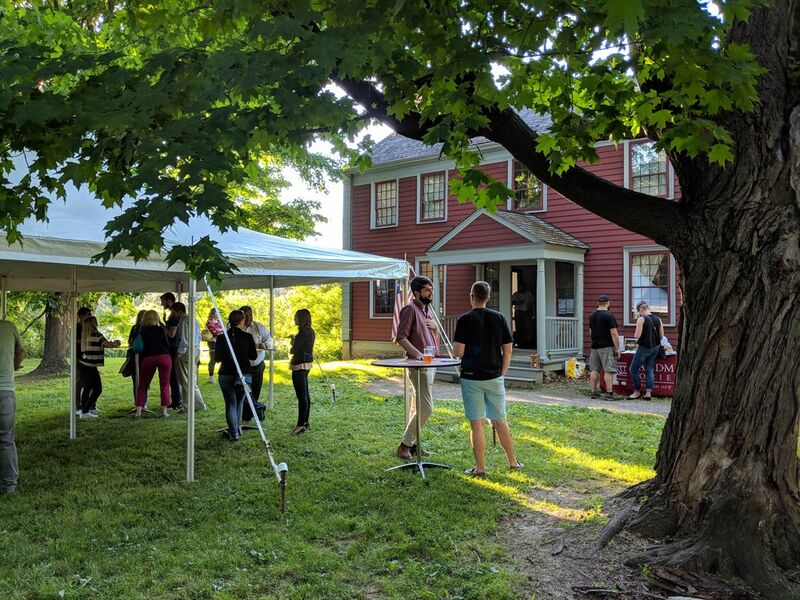 The YUPs and Emerging Rochester Architects (ERA) hosted the first ever Tavern Takeover at the Landmark Society’s Stone-Tolan House Historic Site. 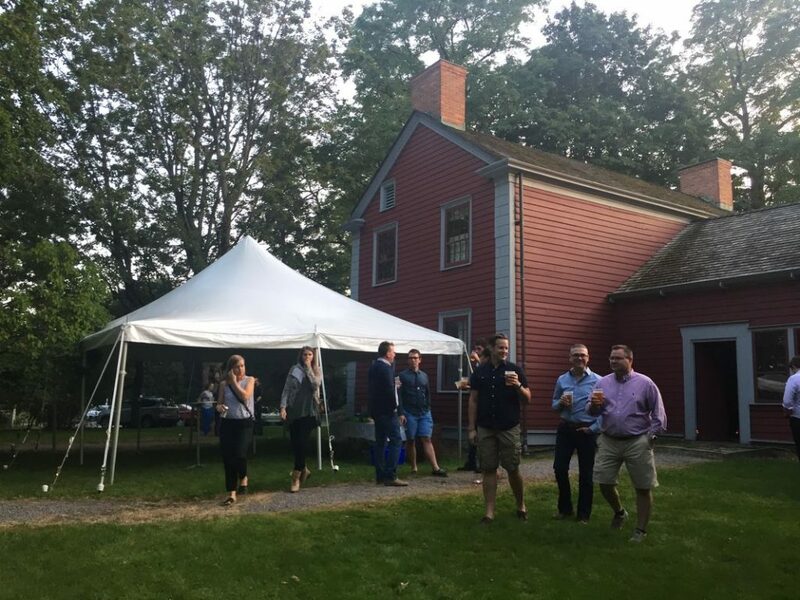 Sponsored by architecture firm, Clark Patterson Lee, the event featured a campfire with s’mores, outdoor snacks, free-roaming of the grounds and, most importantly, beer from Swiftwater Brewing in the historic tavern! We had over 80 attendees (of all ages) join us to stroll the grounds and experience the Stone-Tolan House as 19th century frontier travelers would have. 13. Federal historic tax credits saved! 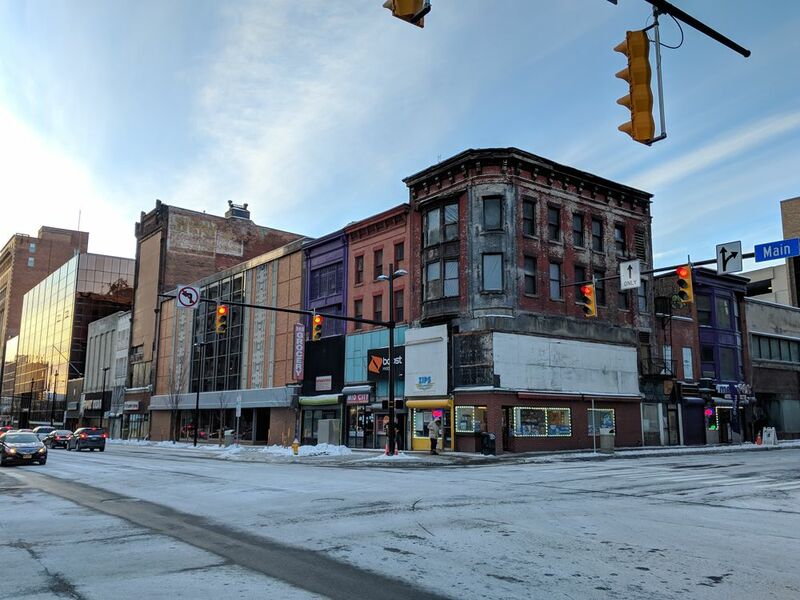 After much advocacy, the Tax Reform Bill retained the federal historic tax credit program, which has made possible many of the rehabs that are catalyzing positive economic and civic change in the western New York, particularly in downtown Rochester, and across the Rust Belt. Released Friday, December 15, this version retained the Senate’s modification of the HTC, which mandates that users must take the credit over five years, instead of in the first year the building is placed in service. 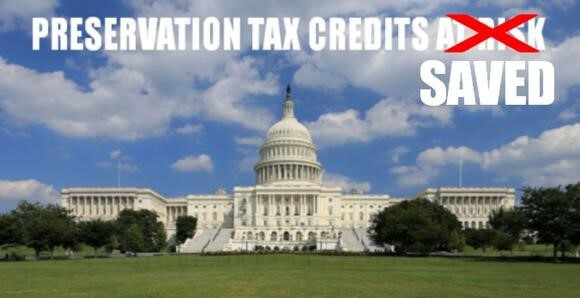 Although this will diminish the credit’s value, it’s a big win for preservation, as the House version of the Tax Cuts and Jobs Act eliminated the credit completely. You can continue to support our work across the region by making a contribution to our 80th Anniversary Campaign. 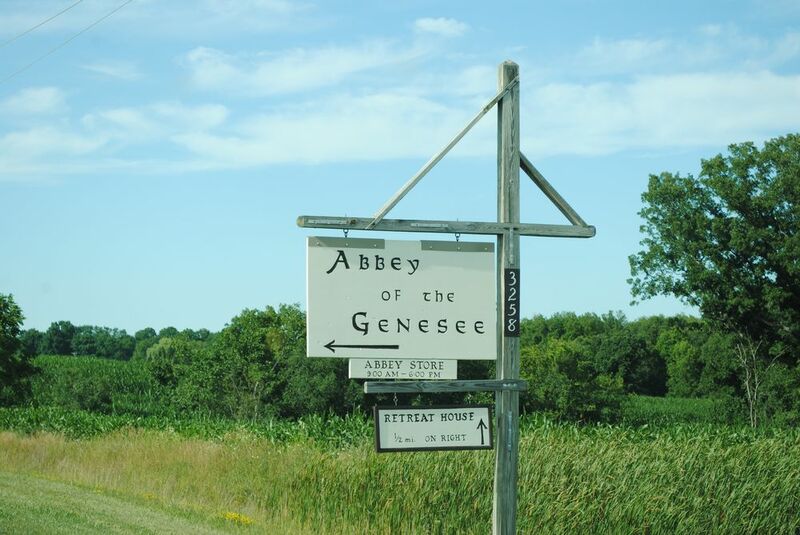 The 2018 NY Statewide Preservation Conference takes place in Albany (April 26-28)! We’ll be surrounded by grandiose government architecture, diverse city neighborhoods, historic parks, and amazing adaptive reuse projects. Experts, grassroots community advocates, and new voices in the preservation movement will come together in Albany to learn from one another. This conference will be presented by The Landmark Society of Western New York, Historic Albany Foundation, The Preservation League of New York State and the New York State Office of Parks, Recreation and Historic Preservation. In order to make this conference a success, we need your preservation projects, ideas and initiatives. Share your success stories, challenges, and new ideas with preservationists and community advocates from across the state. Submit your session proposal by Friday, November 3rd (at 11:59 PM) in order to be considered. Proposals on a wide variety of topics are welcome and encouraged. >>Click here to see more detailed information and submit a conference proposal. 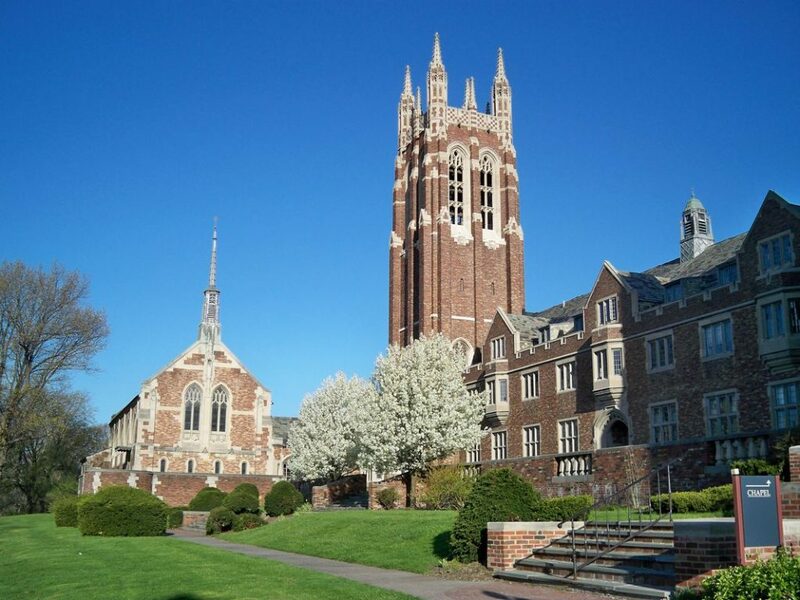 On Wednesday, July 19, the City of Rochester’s Preservation Board and Planning Commission will hold a special hearing to consider the historic campus of Colgate Rochester Crozer Divinity School for City landmark designation. The campus is officially eligible for listing in the State and National Registers of Historic Places; city landmark designation would recognize the significance of the site and help ensure that future development efforts will be in keeping with the historic architecture and landscape. 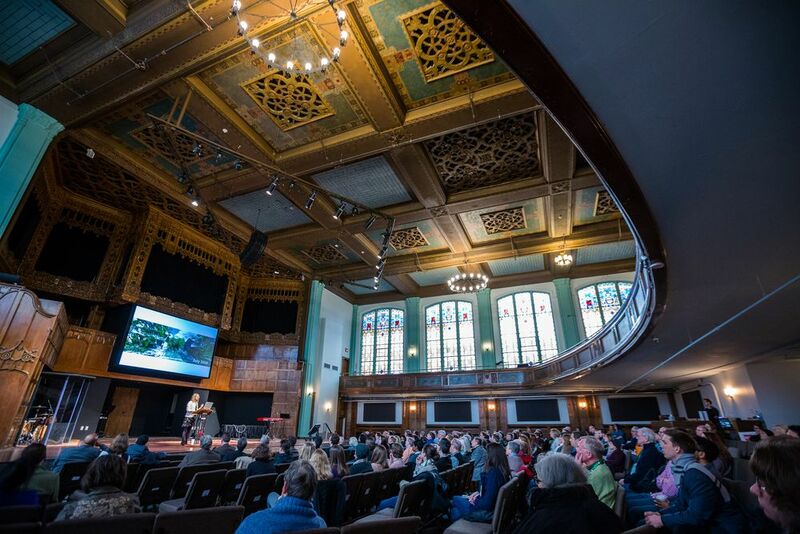 The Landmark Society, along with a coalition of organizations that includes Highland Park Neighborhood Association, Highland Park Conservancy, Community Design Center Rochester, and Historic Brighton, supports the landmark designation of this highly significant historic campus. The buildings and designed landscape of Colgate Rochester Crozer Divinity School constitute a distinctive and unique resource in the Upstate and Western New York region. Its picturesque hilltop setting is a special space, not only aesthetically, but also because it embodies a religious and cultural heritage whose influence extends worldwide. In recognition of its significance, the Divinity School campus and the surrounding community will be well-served by it obtaining landmark designation by the City of Rochester Preservation Board and Planning Commission. future development of the site is consistent with the design, scale and purpose of the original campus as envisioned by architect James Gamble Rogers and landscape architect Alling de Forest. 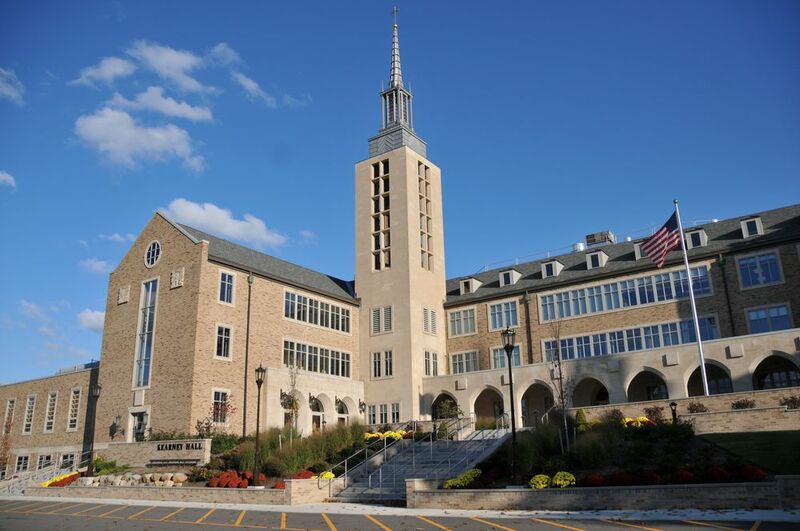 We encourage you to join your neighbors and representatives of local cultural heritage organizations at City Hall on July 19 at 7:00pm to support the nomination of the Colgate Rochester Crozer Divinity School campus to the list of City of Rochester landmarks. Other landmarks include: George Eastman House; Ontario Beach Carousel; Rochester City Hall; and the Powers Building. Take this opportunity to show city officials that this beautiful site is of enormous value to citizens from around the region, who urge its protection for generations to come. Written comments can also be submitted in advance to Peter Siegrist and Jill Wiedrick, Senior Planners with the City of Rochester. In-person comments are the most powerful but advance comments before the hearing will help prime the pump. Feel free to use our talking points above and/or information from the cover letters below but we also encourage you to personalize your letters and comments. Whether you plan to speak or not, attend the hearing and wear green to show your support for the historic campus and buildings. Cover letter to Preservation Board – Submitted with the application for landmark designation, this letter addresses the specific criteria (as stipulated in section 120-193 of the City Code) that the Preservation Board members must use to address applications for landmark designation. Cover letter to Planning Commission – Submitted with the application for landmark designation, this letter addresses the much more broad criteria (as stipulated in section 120-193 of the City Code) that the Planning Commission members must use to address applications for landmark designation. Applications are now available for our next round of funding. 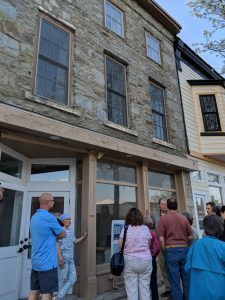 Launched in September 2012, The Landmark Society’s Preservation Grant Fund program offers funds for preliminary design and planning studies to help make positive improvements to at-risk buildings. The program was initially funded through a bequest from Elizabeth (Libby) Stewart. Libby was a longtime Landmark Society staff member who was dedicated to the revitalization of neighborhoods and historic structures. 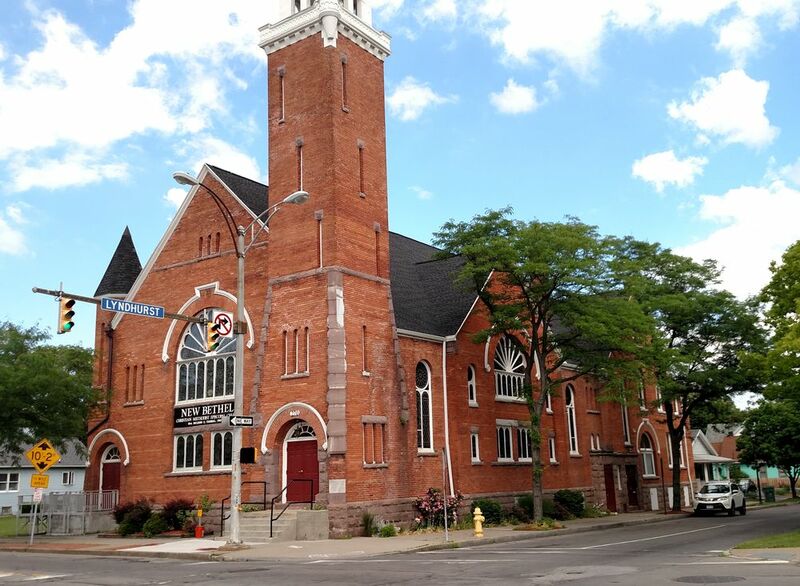 Recent grant recipients have included: Jefferson Avenue 7th Day Adventist Church in Rochester; 6 Madison St. in Rochester; and the Old Town Hall in Orangeville. The amount of each request may not exceed $3,500. It is anticipated that the average gift will be approximately $2,500. Contact Caitlin Meives to discuss your project and obtain an application. Applications will be due Friday, August 4, 2017. For more information, visit the Preservation Grant Fund page.